An alcoholic movie star (James Mason) falls in love with an aspiring singer (Judy Garland) and helps her break through in Hollywood — but his own success is quickly fading, and soon they find their marriage and loyalty tested. Peary begins his review of this “gracefully directed epic remake of the 1937 classic” by citing its infamous 1983 restoration by Ron Haver, pointing out that “as a result we can discover one of the fifties’ finest films”. The remainder of his review focuses primarily on the unique relation between Garland’s “small-time band singer Esther Blodgett” and James Mason’s “fading actor Norman Maine, who sees her sing and detects greatness.” Indeed, while its storyline is firmly rooted within Hollywood — and doesn’t flinch from presenting the seamier sides of the town’s questionable glory — it is the central romance between Blodgett and Maine that trumps all else. As Peary notes, “What makes this film so special and so timely is how mutually supportive Vicki [nee Esther] and Norman are: their initial excitement about and respect for each other never fades away”, even when you’d most expect Norman to become incurably jealous of his wife. Miraculously, “he never feels spiteful about her success, even when feeling self-pity”; meanwhile, “she recognizes that her success is due to him… and won’t desert him when everyone else has”. It’s a refreshingly heartwarming romance, yet one which never descends into undue sentimentality. 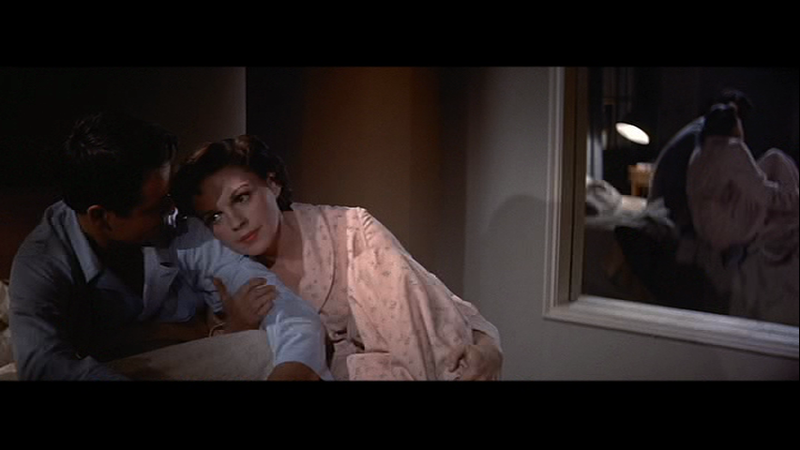 A Star is Born benefits from masterful direction by George Cukor, impressive early use of the Cinemascope process, vibrant cinematography and art direction, and a top-notch, “cynical yet compassionate you-and-me-against-the-world (Hollywood) script” by Moss Hart — yet it is the “wonderful, deeply affecting performances” by Garland and Mason that I believe are ultimately responsible for making this film such a timeless classic. Garland’s performance is the one that generally receives the most attention, for multiple reasons: it was her “come-back” role several years after leaving MGM, and her presumed victory in the Oscars race was trumped by Grace Kelly’s unmerited win for The Country Girl. Garland is indeed marvelous here; as noted by Peary in his Alternate Oscars (where he instantly hands her the award she so clearly deserved), she gives “the finest performance” in her career, playing a woman with “amazing depth, wit, resilience, [and] graciousness”. While “Garland always played nice girls”, he argues that “this was the first time [her] character’s goodness comes from the soul”, and notes that “Esther-Vicki is Garland’s most mature character and the one who has the most passion”. In addition, he points out that “playing Esther-Vicki let Garland demonstrate her remarkable musical versatility”; while “we are told Janet Gaynor’s Esther-Vicki has talent in the 1937 film, Garland proves her star talent”. However, Mason’s performance is equally impressive — and if it weren’t for Marlon Brando’s astonishing turn as Terry Malloy in On the Waterfront (another of my all-time favorite films), I would argue that Mason equally deserved top recognition at the Oscars that year. 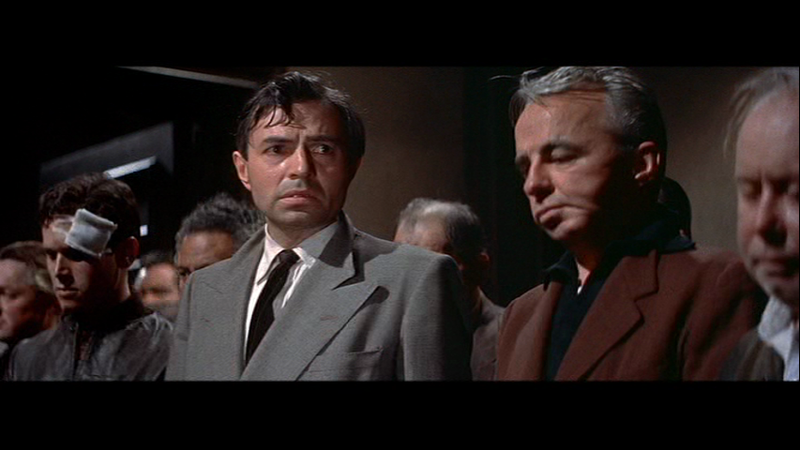 Not a single moment of his performance here is anything less than nuanced and revelatory; the fact that he emerges as one of cinema’s most sympathetic has-beens is especially astonishing after watching his cringe-worthy entrance on the screen during the film’s opening sequence, when he and Garland “meet cute” (if you could dare to call it that). One fully expects this man to be someone Garland should stay miles and miles away from; therefore, his emergence as a man truly dedicated to his wife’s success, despite his own significant career challenges, is a pleasantly unexpected development. From his refreshingly authentic reaction to the egregious “transformation” attempted on Esther-Vicki by the studios, to the final heartbreaking scene in their beachside bungalow (watch his expression as he overhears Garland talking with studio head Charles Bickford), this is a man worthy of so much more respect than his insidious disease allowed him to maintain. Absolutely; this one is a gem on multiple levels. A must – and very worthy of revisits. Here is a film that makes me genuinely sad. Not because the story itself is tinged with sadness throughout. 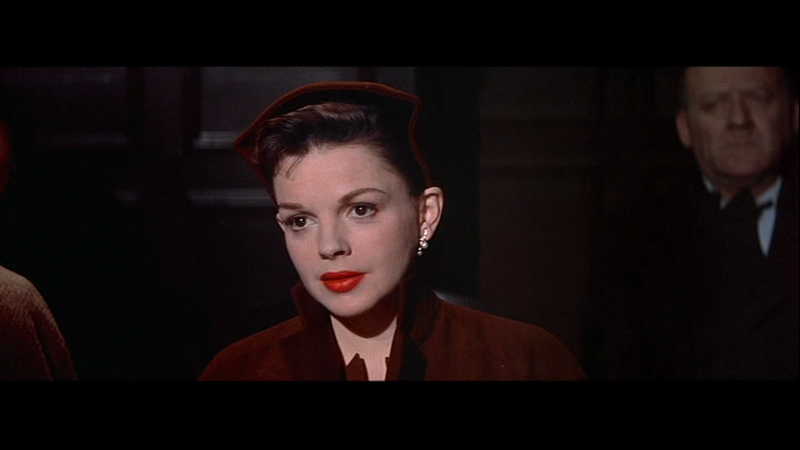 But mainly because of Judy Garland. More than any other film Garland made, this is the one that makes me focus on her as an enigma. I’ve seen ‘ASIB’ quite a few times. Seeing it this time, I was looking through the film more than at it. I was enjoying it as much (many don’t like this film, considering it overblown) but I was simultaneously pondering, ‘What exactly happened to her? What exactly went wrong?’ The only conclusion that was beginning to make sense to me was…she was simply way too unique for her own good. 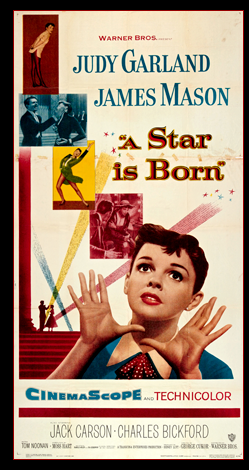 So much so that, in her very awkward attempts to deal with the product that the world knew as Judy Garland, things weren’t going to just spiral down…they were going to spiral in all directions, none of them ultimately up. From accounts I’ve read, ‘ASIB’ (in its restored version, esp.) comes off as a happy accident. Production was plagued with problems. (Wikipedia lays much of this out.) Filming went on for ten months. Cukor left the production before shooting of the stunning ‘Born in a Trunk’ sequence even began. When Warner Bros. finally stopped feeding money, Garland and her producer husband, Sid Luft, began banking in. And, apparently, those are just some of the main issues. But, of course, there is the final product to consider. You don’t have to look deep into the picture to see its somewhat anti-Hollywood stance. Certainly the sentimental Academy noticed. (‘ASIB’ was not nominated for Best Picture; one might think Hollywood types of the day did not take kindly to Moss Hart’s particular take on how Hollywood worked.) Given the POV that the film shows, and the fact that Garland (at the time) had a bad rep as a ‘career-burner’, it shouldn’t surprise anyone that the Academy did not give the pic a nod and that Garland did not win. One can occasionally quibble with the film. For example, could Garland’s Esther – while being basically told by Mason’s Norman that she just sang the hell out of ‘The Man That Got Away’ – really be that surprised to hear that she sings that well? I hardly think so. But quibbles are really minor. Though I find the film’s drama essentially solid (not turgid, as many think), ‘ASIB’ is ultimately a showcase for Garland’s powerhouse talent as one of the most expressive vocalists ever. 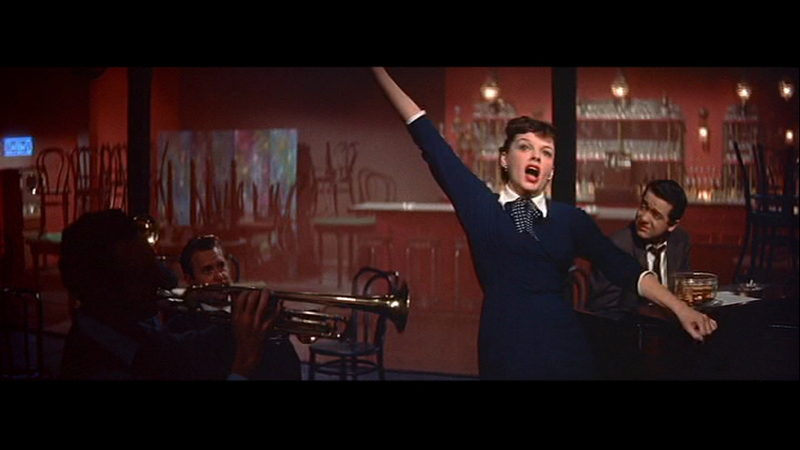 Fittingly, she not only gets the centerpiece of ‘Born in a Trunk’ (a mesmerizing and often-hilarious film in itself – and apparently Bogart supplies one of the voices for “Sing ‘Melancholy, Baby'”; a nice touch) but she is given a number of marvelous songs by Harold Arlen and Ira Gershwin. (Though I don’t think ‘Here’s What I’m Here For’ works at all, really.) Needless to say, ‘The Man That Got Away’ is a torch song to end all torch songs; Garland’s rendition is chilling and definitive. 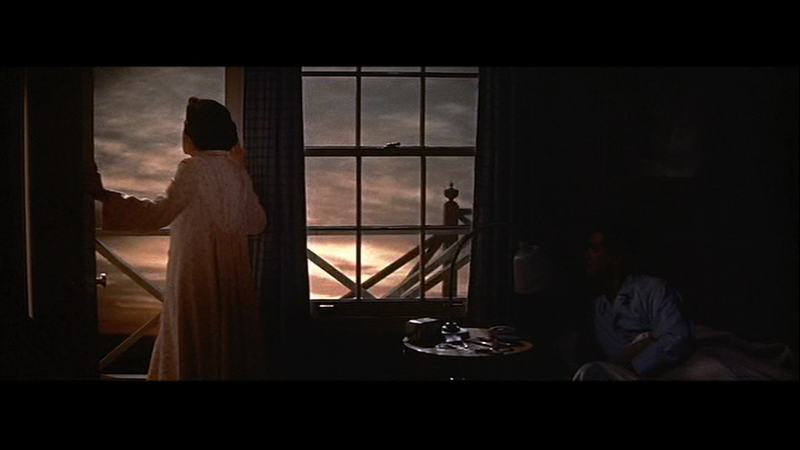 Toward the film’s end, Garland has a monologue in which (to Bickford) she finally unleashes her pent-up anguish re: Mason. Of course, those in the know can’t help but sense that Garland appears to be talking more about her real-life self than her on-screen husband. Thus, the overall sadness I feel re-surfaces here. And then it gets spooked, big time. At the end of this speech, Garland’s Vicki returns to the sound-stage set to do a re-take of ‘Lose That Long Face’. In a nanosecond, she literally ‘turns it on’, her face shifting from tragic star to rousing show-stopper – and the irony of the song chosen there does not go unnoticed. Should Garland have won the Oscar? Absolutely. Would a win have significantly altered her life – or psyche – for the better? (~a question that might not be asked of any other performer, ever.) One has to wonder. Garland did make a few more films after ‘ASIB’. But it would seem something clearly ‘happened’ after Garland’s experience with this film. Whatever it was ties in with what makes me sad when I watch it. – The DVD contains three alternate versions of Garland singing ‘The Man That Got Away’ (with differing visual looks). One can easily see why the one used for the film was the one to go with. Still…check out the alternates. Fun to compare. – It’s quite interesting to compare the performances of three supporting cast members with their work elsewhere: Jack Carson is seen (with good reason) as more of a heavy here than usual; Tom(my) Noonan does quite well in a dramatic role here – compare it with his turn as a nerd in the previous year’s ‘Gentlemen Prefer Blondes’; as well (and I’d not noticed this before) the small role of oh-so-pretentious starlet Lola is played by Lucy Marlow – she didn’t have much of a career but her performance in the following year’s ‘Queen Bee’ is polar-opposite. – On checking, screenwriter Hart is discovered as gay (tho married) and bipolar. Not that either of those things matters directly in terms of ‘ASIB’…but one wonders. – One of the joys of Scorsese’s ‘New York, New York’ is, of course Liza Minnelli’s own spin on ‘Born in a Trunk’: the just-as-long and equally-as-satisfying ‘Happy Endings’ sequence.